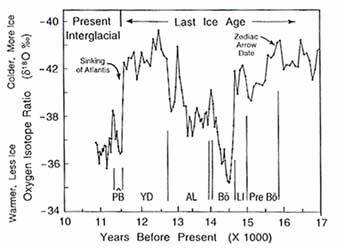 Climate profile charting oxygen isotope ratio in the GISP2 ice core as an indicator of air temperature over Summit, Greenland. Higher temperatures (and less glacial ice) plot downward. Climatic zones include: Pre-Bölling Interstadial (Pre Bö), Lista Stadial (LI), Bolling Interstadial (Bö), Allerod Interstadial (AL), Younger Dryas Stadial (YD), and Preboreal warming (PB).